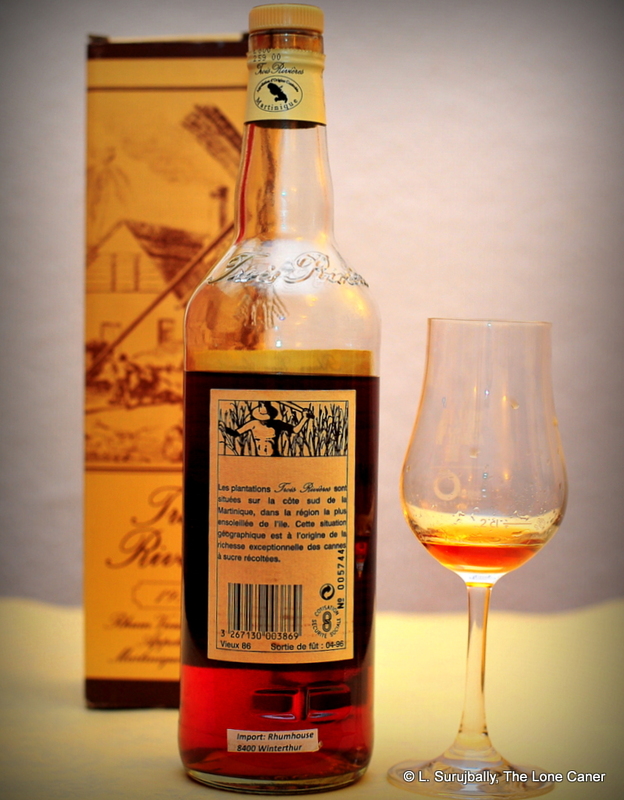 Like a kilt, this ten year old rhum proves that less can often be more. The Japanese art of ikebana is that of flower arranging, and if you think its principles lack applicability to rum, well, give that some thought. Sorting a big bunch of flowers into a vase is not what it’s really about (one could say the same thing about the chanoyu). The true art is about selecting just a few elements, and finding the perfect way to arrange them so that they rest together in harmony. Trois Rivières is unlikely to have studied the matter…but this rum displays all the fundamentals of both art and simplicity, in a way that elevates the whole to a work of sublime grace. 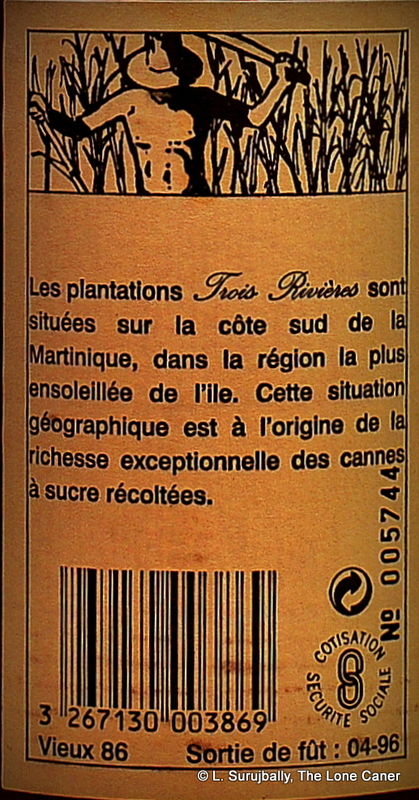 Trois Rivières issues specific years’ output, perhaps more than any other rhum maker in Martinique (except maybe Neisson) – there are millèsimes from 1953, 1964, 1969, 1970, 1974, 1975, 1977, 1980, 1982, and so on. Rarely, if ever, is it stated how old these are, aside from the “vieux” notation, meaning a minimum of three years ageing. But to my mind, a rhum this good (sorry for the spoiler, but you already know the score) is a poster child for why we need the guys pushing great hooch out the door to stop messing about and tell us poor lambs what we need to know right up front – in this case, how old the thing is. Because speaking purely for myself, I want to know whether age is the primary factor in the excellence of the 1986 millèsime over the 1975, or some other factor. I can tell you though, that my small disappointments and whinges from above were forgotten the instant the bottle was opened up and poured it into the glass. Because with a nose like the one it presented, I could swoon like a maiden from Walter Scott. It was so sweetly wonderfully rich that I almost went running for my thesaurus. It opened with juicy pears and white guavas, fennel and the faint lemony twist of a good cumin. Scents of treacle and honey followed on, very rich and smooth and almost perfect at 45%. Even after half an hour it kept giving out some extras – vanilla and well-controlled tannins, almonds, very light smoke and leather. The 1986 blew past the 1975 millèsime from the same company as if it was standing still, which was why I wrote about the latter the way I did. It was similarly good to taste, and again showed up some of the shortcomings of the 1975. Warm and smooth, the 45% strength didn’t hurt it at all. Medium bodied and dry (but in a good way), providing first tastes of peaches, plums, more guavas, black grapes. 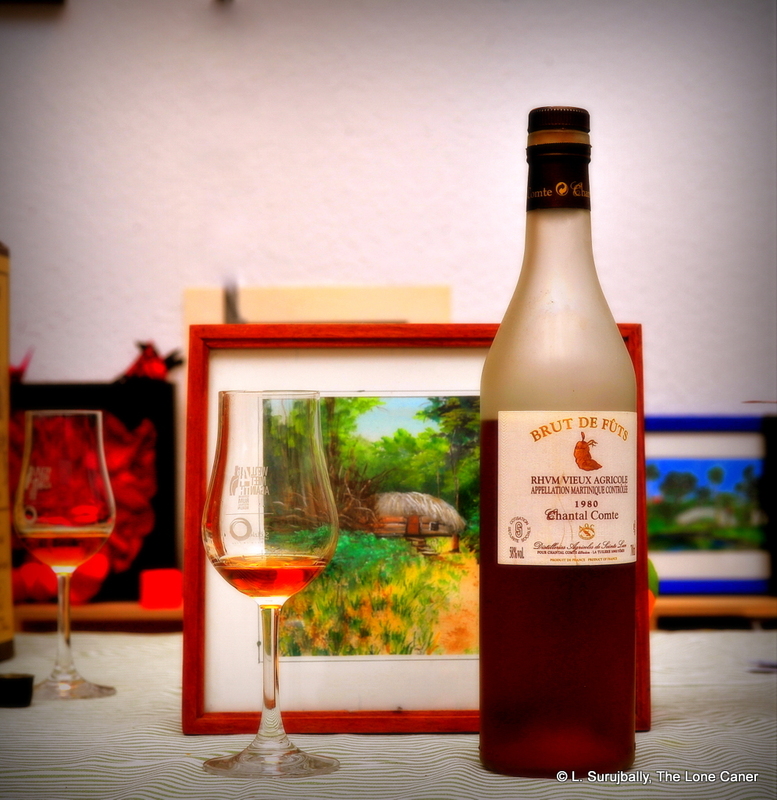 I was actually a little startled at the fruitiness of it, because it was an AOC designated rhum, but where were the light, clear notes one could expect? The grassy vegetals? Luscious notes of licorice and vanillas and even molasses backed up the zesty citrus notes that gradually came to the forefront, and again there were these delicate hints of cumin and lemon zest I had observed on the aromas. And this was not all, because tart (not sweet) red fruit – strawberries, red currants and raspberries also made themselves known…I kept asking myself, how old was this thing? Even on the medium long finish, which was a bit dry, warm and breathy and easy-going, some of those fruits retained their ability to amp up the enjoyment – prunes, licorice and vanilla for the most part, and always that citrus component which coiled behind the primaries to lend a unique kind of counterpoint to the main melody. The question I asked of the 1975 (which I was using as a control alongside the Rhum Rhum Liberation Integrale, the Velier Basseterre 1995 and two Neissons) was how old it was, and the labelling on that one was at best inconclusive. With the 1986 things seemed a bit more clear: the box had a notation “Vieux 86” and next to that “Sortie de fût: 04-96” which I take to mean it was distilled in 1986 and released from the barrel for bottling in April of 1996…a ten year old rhum, then, if the numbers mean what I say they do. TR never did get back to me on my inquiries, so if anyone has better knowledge of the age of this rhum, feel free to share. I’m going to go on record as believing it’s ten. bottle is, the better the rhum inside must be (and the more we can expect to pay for it). The Trois Rivières 1986 shows the fallacy of such uncritical thinking. Like the Chantal Comte 1980 it demonstrates that great rums can be made in any year, at any age…and that beauty and quality and zen are not merely the province of those who fix motorbikes, pour tea, or arrange flowers. Proof that year of make does not confer exceptionalism. 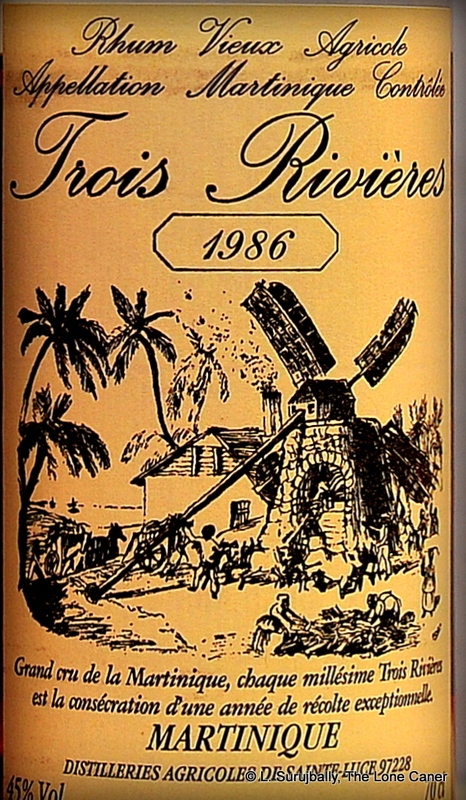 Trois Rivieres in Martinique is over 350 years old, formed in 1660 when Nicolas Fouquet, Superintendent of Finances to Louis XIV, won a large concession of about 5,000 acres in the south of the island, where it remains still, after many changes in ownership. 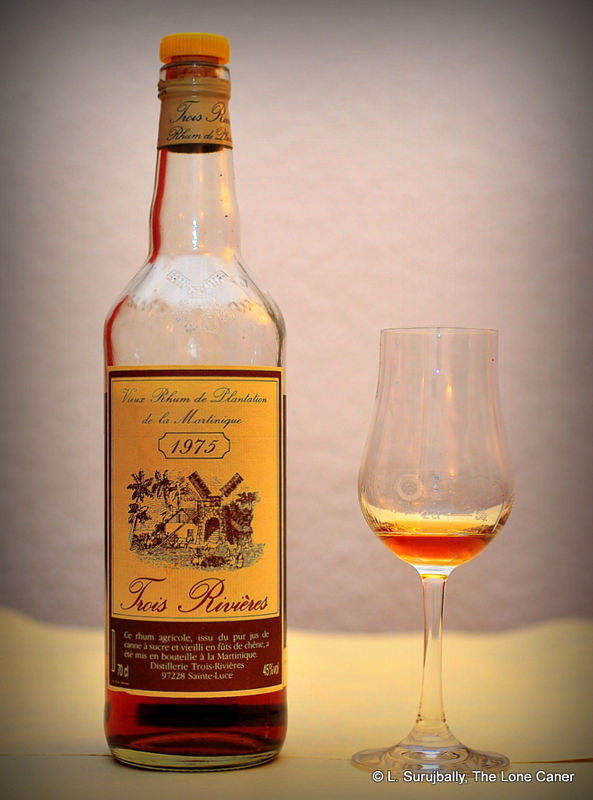 In 1953, the Marraud Grottes family, owners of their own distillery and the Duquesne brand, bought the estate and sold aged Trois Rivières Duquesne rhums under the brand until 1972. 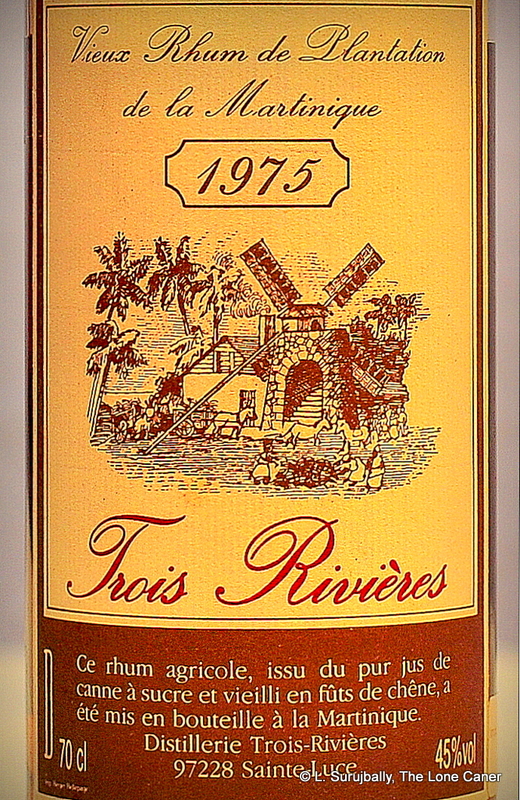 In 1994 the Trois Rivières distillery was acquired by the company BBS, which also had the La Mauny brand, and they’ve held on to it ever since. I thought that the 1977 millèsime might be the oldest one I’d ever get (and I’ve been keeping an eye on the 1953), but when I managed to source the 1975 (and 1986) millèsimes, well, I jumped. 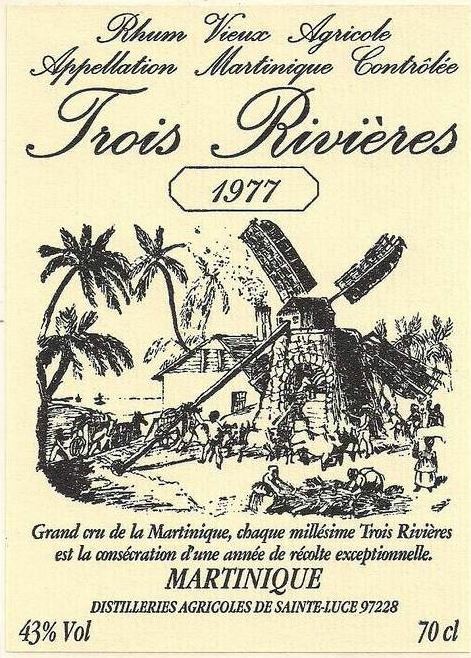 Trois Rivieres is certainly one of those French island companies that prides itself in specific years’ output, perhaps more than any other rhum maker on the island – there are millèsimes from 1953, 1964, 1969, 1970, 1974, 1975, 1977, 1980, 1982, etc etc etc…you get the point. The really odd thing about them is that rarely, if ever, is it stated how old they are, aside from the “vieux” notation, meaning a minimum of three years ageing (see “Other notes” below). 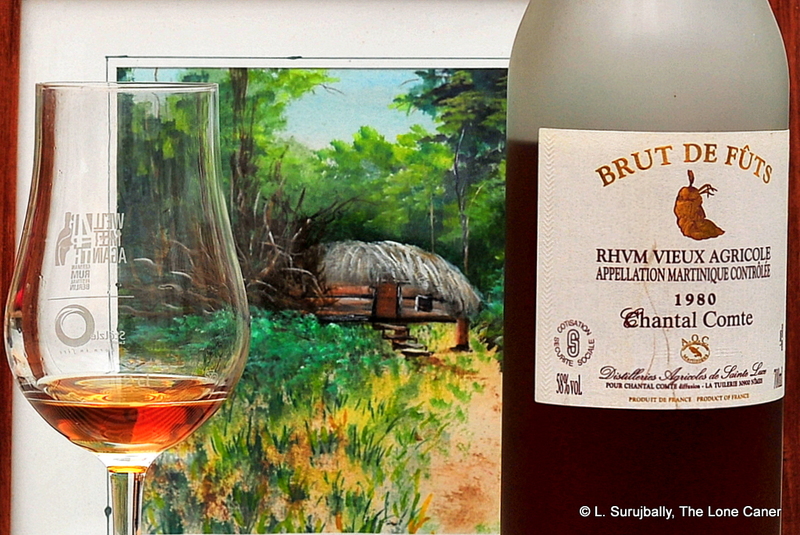 Which may be one reason why I thought the 1986 rhum was better than this one from eleven years earlier. Presentation was a consistent yellow box for these oldies(I’ve seen several millèsimes with the same one) with that famous windmill, the year 1975, enclosing a slim bottle with the same info on the label…and surmounted with a tinfoil cap, which struck me as strange, but okay, perhaps when it was made wrapping and toppings were different. An amber red rhum gurgled invitingly within. 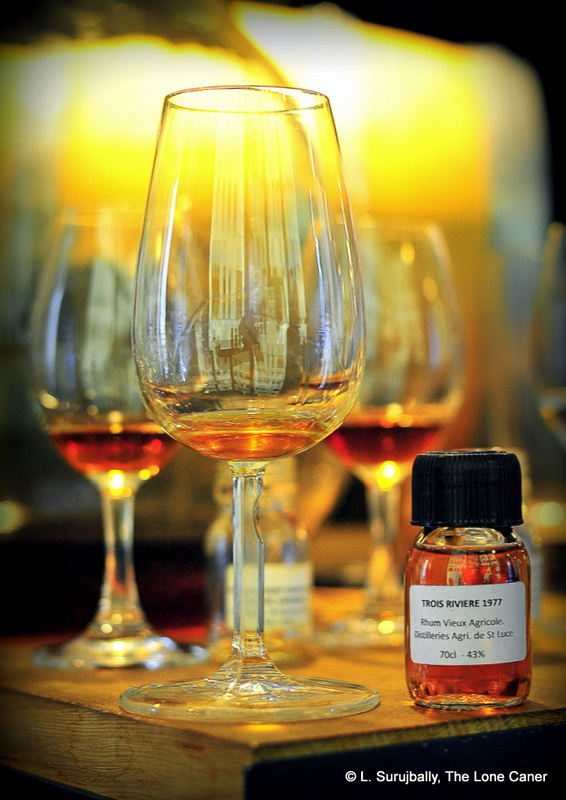 For a 45% ABV rhum, the 1975 was quite soft to smell, more so than the 1986. Nougat and vanilla flavours led right off, with more delicate, floral and grassy scents curling right behind them. Lighter fruit, raisins and dates followed swiftly, and while the 1975 was not entirely salty, some small element of brine was definitely there, as were faint rubbery notes and pencil shavings of the sort that used to litter my geometry set in primary school. My contention is usually that an older rhum or rum is, on balance, a better one – the complexity that ageing imparts cannot be easily duplicated or faked, and if one tries enough products, sooner or later the difference is self evident. Hence my feeling that for all its supposed antecedents, the 1975’s ageing (whatever it was) was not sufficient to elevate it to the status of cult classic. I wasn’t terribly excited here: the taste was a bit thin, without as much depth and richness as one might expect. That’s not to say it was bad or lacking in complexity…because I tasted caramel, raisins, sugar water, honey, prunes, freshly sliced cucumbers, green grapes, more grass and some white guavas, and this was a pleasant melange to experience – it was a perfectly good nose, just not a great one. The mouthfeel somehow also didn’t come up to par for something about which I had higher hopes (again, the 1986 tasted in parallel outclassed it) because of a lack of overall body and elegance of texture. Adding water did bring out some background flavours, mind you – more nougat, toffee, cafe latte, with the slight citrus taking something a back seat. The fade was all right, neither failing nor exciting, giving up some nice florals, nuts, a bit of leather and vanilla and subtler grassy notes. In other words, an above-average agricole, unaggressive, interesting and very easy to drink, which probably cost me too much. I think that in another year I’ll look at it again and share it around with the Rumaniacs, see if their opinion is the same. It’s funny, in a very short space of time I’ve experienced two rhums that had older brothers, and in both cases those older ones were effortlessly outclassed by their younger siblings. The 1980 Chantal Comte decimated the 1977, and now the 1975 Trois Rivieres is not as good as the 1986. If there’s ever been a reason why I want more information on a label, this is it, because I’d dearly love to know if it was ageing that caused the difference in quality, or some other factor. If nothing else, this is perhaps why one should never take reported age or year of make alone as the sole arbiters of how good a rum “should” be – because here I got two that say exactly the opposite. So back to how old this thing is. Yes the “vieux” statement supposedly tells its tale. Cornelius, Henrik, Gregers and I pored over the labelling and the box to see if there was something that could give us a clue, and came up with this little mark at the bottom right of the label, where it says “Emb. 97209 A”. Could that mean bottled in 1997-2-09 or 1997-20-9? If that were true, the thing is 22 years old. But in that case, why not say it is a très-vieux, or XO? On the other hand, it could refer to the postal code of Fort de France on Martinique, so don’t take my conjecture as gospel. The mystery deepens until Trois Rivières (or any reader) can provide more information. Not entirely sure how old this is…I think it was bottled in 2000 or so, making it at least a twenty three year old. 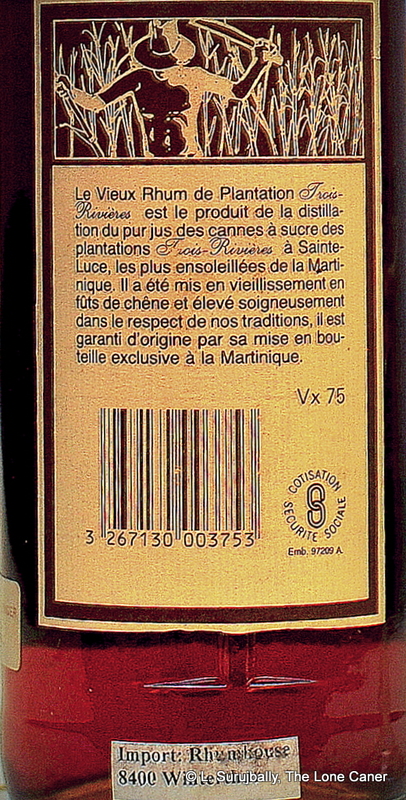 AOC controlled from Martinique, pot-still-made from cane juice (of course). Taste: Oh, nice, very well put together. Again dry and vegetal (the nose wasn’t lying), even a bit minty. Warm and assertive, and enough potency to make you think it was actually stronger. Anise, citrus peel, more spices, sushi (maybe seaweed). Somehow all these things work reasonably well together. Didn’t bother adding water on this go-around – at 43%, didn’t really want to. Finish: Long, aromatic, dry; that anise/licorice starts to come forward at the back end, isn’t balanced as well with other notes as it could have been. Thoughts: Great, complex nose, quite a smorgasbord on the palate, an agricole all the way through.